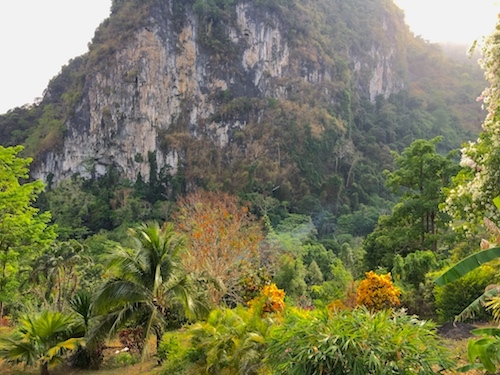 The setting for the snake / reptile internship will take place at a wilderness resort location on the edge of dense primary Thailand rainforest on the Malayan Peninsula. You need not be a student to join the ‘internship’. We’ve revised this page to de-emphasize the reptile internships, and emphasize instead your planning a 1-4 week visit which will basically be a schedule we create with you to optimize your time while in southern Thailand. One week is enough for most people who want to do 1-2 field trips per day to find snakes or other reptiles. Within a week, we should be able to find a dozen species of snake, as well as gliding lizards, gliding geckos, monitors, hog badgers, tarantulas, tokay geckos, and a large variety of wildlife in the rainforests of southern Thailand. Three hour field trips can be arranged in the morning or evening, as required. Your lodging, food, and transportation is your responsibility, but we can of course help you set these essentials up during your stay. Read over the information below describing the Snake/Reptile Internships, and send us the email requested, and we’ll get back with you quickly. NOTE – You need not be a student in a university to join this internship. We will be offering the opportunity for up to 8 persons each month in 2018 and 2019 for April to November to stay in Southern Thailand with us to study and work with snakes (reptiles), amphibians, insects, or whatever you’re interested in. We are especially interested in, and knowledgable about snakes and other reptiles, but all are welcomed. You need not be a student of biology or a conservation major at a university to take part in this unique learning environment. Most of our applicants are just graduating from high school and want to get more experience finding and handling reptiles. 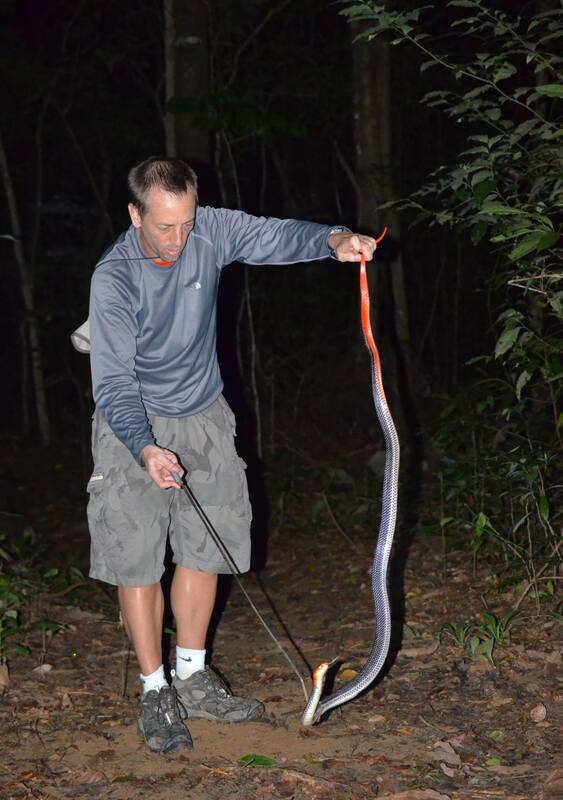 Andy from Washington State, USA with a Triangle Keelback (X. trianguligerus) he found down near the mountain stream. Amazing colors, and this snake is a very common sight in our location. This primarily self-guided experience can be adapted to fit your needs. If you want to obtain a lot of experience finding snakes or other reptiles or wildlife in the rainforest – we can focus on teaching you the skills needed to find them. If you want to become better at handling non-venomous or venomous snakes, we can help you accomplish that. We want to help you fulfill your goals and objectives while here. You will use this short time (typically 1-4 weeks per placement) to accomplish as much as possible. While we can suggest some general goals, each internship participant will come up with a list of objectives to complete during the internship. SCHEDULE – Sign up for these months in 2018 or 2019. Participants in the program will be housed in a bungalow like the one shown, at a wilderness resort primarily. 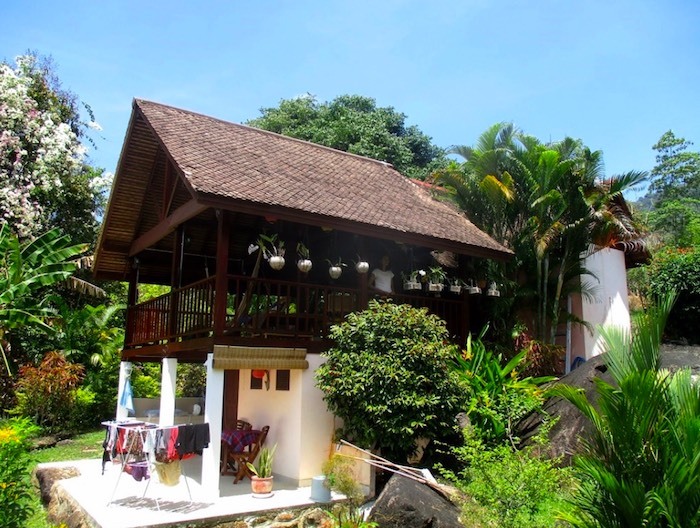 There will also be some short field-trips where we’ll stay in bungalows or hotels elsewhere. Single bungalows, or if we have a group, we may get one of the large houses – they are much more comfortable. Males with males, females with females. Your room will usually have a bed, table, chair, fan, hammock on the porch or balcony. There are restrooms in each bungalow with hot water showers. We now offer this bigger bungalow for interns, quite an improvement over the smaller units last year! View 1 from the bungalow. View 2 from the main bungalow. Basic – Male or Female; 18 yrs or more; High school graduate; English (speaking). Can communicate effectively, professionally, and politely with others. Positive attitude and strong work ethic is necessary because occasionally hours will be long and it can be hot and humid. 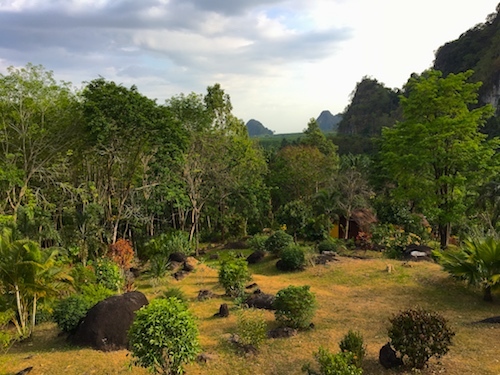 Interest – Participants should have a very high interest in learning about snakes or other reptiles and wildlife local to the Krabi, Thailand area. Interns should have an insatiable desire to learn more because the opportunity is what makes this internship the best in the world. 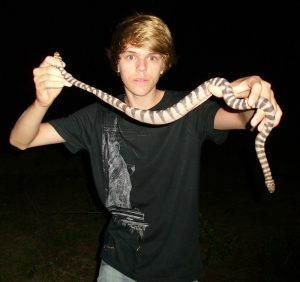 Background – Comfortable handling non-venomous snakes and other reptiles on a daily basis, or willing to learn. We are really looking for people with a strong strong interest. College doesn’t matter. Experience doesn’t matter. The key is desire to learn. Physical Condition – OK with hot and humid weather. June temperatures in our area are around 29-30°C average. July around 28°C. October maybe 26°C. Participants should have no problem walking for hours on flat ground, and hiking up small ‘mountains’ of 500 meters elevation occasionally. No limiting medical conditions. 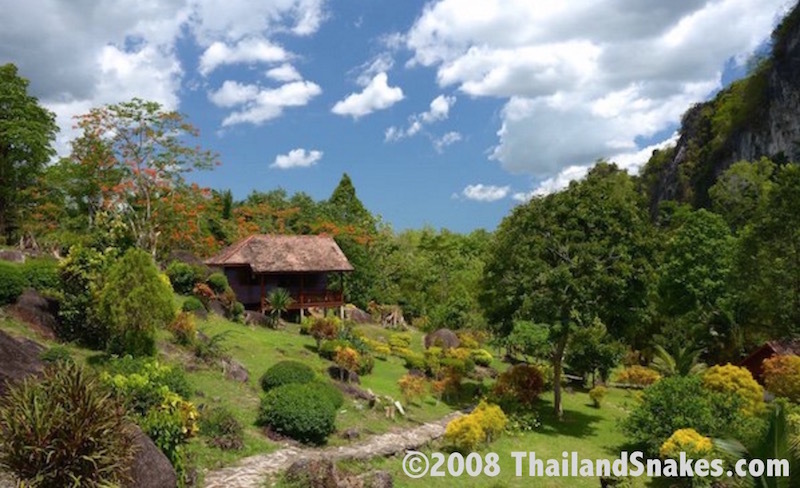 Healthy, with no life-threatening illnesses or allergies that may be exacerbated in Thailand. Insurance – You will need comprehensive health insurance which covers your stay in Thailand, or, cash available to pay for treatment in case of major accident (around $8,000 USD). You’ll be required to sign a waiver stating you have one or the other. Our Safety Record – We have a flawless safety record. We’re proud of that, and we take safety very seriously. We have never had anyone on our field trips bitten by a venomous snake and we’ve been doing this since 2009. In the case of emergency, we have well-equipped hospitals within a short drive. All hospitals are required by law to have anti-venom for common venomous snakes found in our area. Interns will help with whatever research projects we are doing at the time. This is an intensive program with one rest day per week if doing 2 weeks or more. If here for one week – it’s straight through – 7 days. We sometimes have excursions to field herp new wildlife locations -and we may need to travel by vehicle for a couple hours to reach the location. We have a number of herping spots close to us – including primary forest, rubber tree plantation, grounds of the wilderness resort, national parks, caves, and mangrove areas. 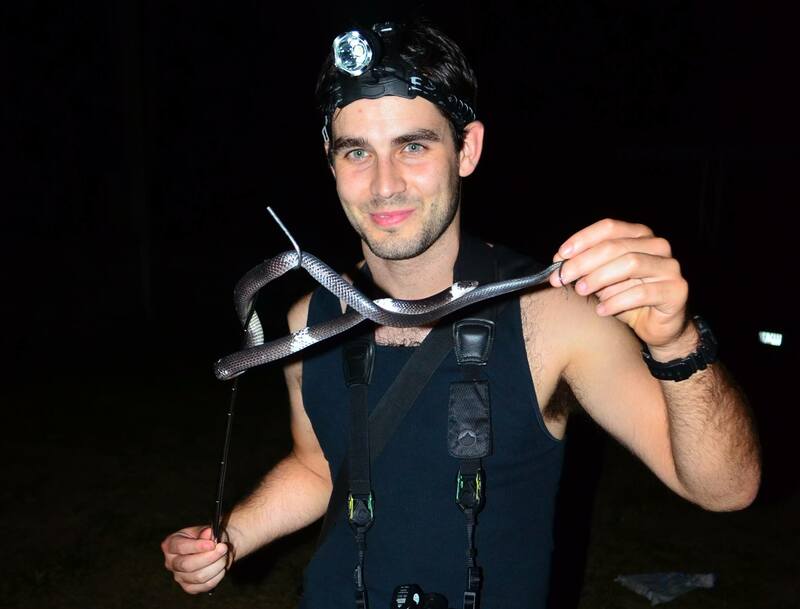 Herping in Thailand – The Essentials. This is a helpful page that lists some of the essential clothing and tools you will want to bring with you for your internship. There is no set deadline. We may choose to accept interns at any time. It is better to send your application in as soon as possible. NOTE – WE ALREADY HAVE PEOPLE APPLYING, AND WE HAVE ACCEPTED SOME APPLICANTS IN 2018. APPLY RIGHT NOW TO ENSURE YOU HAVE A GOOD CHANCE TO GET IN DURING THE WEEKS YOU PREFER! We have added more things to do, and better accommodations. We encourage you to look at reptile programs all over the world and see if you can find something that compares. We pride ourselves on offering the most unique and complete experience available. Your internship will be a once-in-a-lifetime experience you’ll be telling your grandchildren about – we’re sure of that! Note, this doesn’t say stipend, or salary, or income… This is what you will need to pay to cover your costs. We are not funded by grants or outside agency. We have the great location and expertise, but no grants to cover all our expenses. Food – 3 meals per day in the on-site restaurant or wherever we happen to be doing field trips. There is a limit on food per person per day. Snacks and beverages not included. This has been more than enough for everyone (so far). Food is not expensive in Thailand. Room in a bungalow in our wilderness resort, or other hotels, bungalows, or in our home when convenient. Transportation (Krabi International Airport (KBV) and Bus Station Transfers). Instruction, guidance, supervision, assistance with research projects. Supplies (5 internship t-shirts, snake bags, etc.). A non-refundable deposit of 25% is to be paid upon acceptance. We can send an invoice by email which you can pay using credit card, debit card, or e-check. It takes about 10 days to go through the system, so you will need to send by January 15th. Balance to be paid in cash on Day 1. We may accept a candidate for two successive months (or possibly longer), but we must be notified well in advance that this is your intention. We will figure out a special price for you. CONTACT US Here. Full name, gender, age, address, country of citizenship, email. Any allergies, phobias, physical or mental illnesses? Please explain fully. Which day, month(s) and year would you like to start and for how long will you stay? Would you like to stay longer than one month? Have you been in a jungle / rainforest environment before? Provide details – when, for how long, where, doing what? What is your interest in snakes or reptiles in Thailand? Why would you like to join this reptile internship? What do you want to focus on and accomplish? Have you handled reptiles before? Venomous snakes? List species. If you are currently studying in a university, or have been – what was your major, minor? What is your goal 5 years from now – relating to reptiles? Anything else you would like to tell us or ask us? 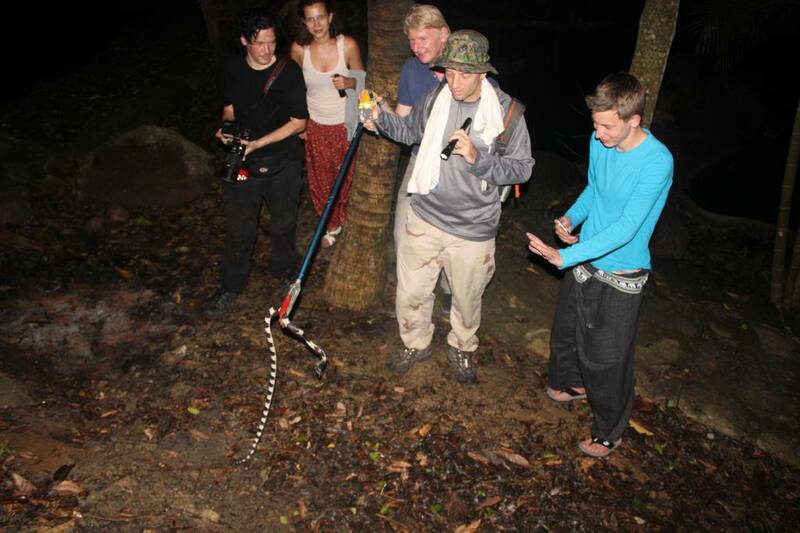 Showing some tourists one of the snakes in Thailand with very potent venom – the Malayan Krait. Vern with red-headed krait – deadly and rare on a field trip down to a national park in Trang province. Elliot from the UK with a wolf snake found at the resort grounds while herping with us on a field trip. David F. found this amazing Achrochordus granulatus in a river close by.